(*Prakash Chawla) India @70 has moved with the world, evolving into a strong nation that has traversed different economic ideologies with some of the policies even turning upside down in the last seven decades. The feat to be among the fastest growing economies did not come about on the back of a diktat of a communist regime but in the world’s largest and thriving democracy with a social diversity that is wider than that of continents. Governments of the day always have a crucial role in nation building, but it is the people whose ideologies, convictions and aspirations must reflect in the directions and decisions of a state. In an ever-changing world, these aspirations are not static but quite dynamic, throwing new challenges for the leaders who are given the responsibility to govern, whether it is now or at the time of Independence. Let’s do backward counting. Jury is still out and the best thing to do in the big time, life changing decisions is to leave it to the history to judge. So, the history will judge how the landmark decisions of the Narendra Modi government made a difference to the lives of the people which elected it with an impressive majority in the general elections of 2014. The policies and the theme behind the same do reflect aspirations of the people, but at times, they are an outcome of frustration which must be dealt with by the leadership in charge. Take for instance, the crackdown of the present government on corruption and black money. What does it reflect and why does it have a large popular support, though there are bound to be critics in coffee houses and drawing rooms? 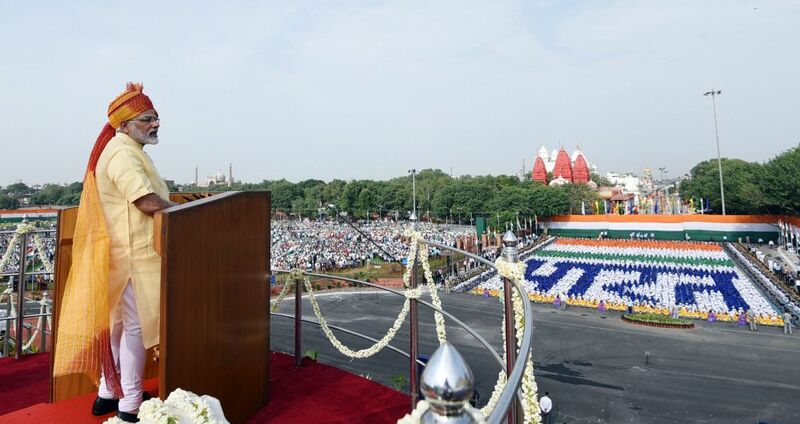 In his Independence Day address to the nation from the ramparts of the Red Fort, the Prime Minister referred to frustration among the people about the menace of black money. “My dear countrymen, today those sitting on the loots of the people are not able to sleep; but this raises the trust of the hard- working and honest people who now think there is a value for their honesty now. Today there is a festival of honesty ….” Shri Modi’s reference was to the crackdown on black money through various laws and measures such as Benami Property laws, GST and demonetization. Whether it is demonetization or data mining about the tax evasion, people at large relate themselves with these actions and support them. Some parts of the trade and industry, especially those which are included in the tax net for the first time, may be dealing with teething troubles, but GST would emerge as a popular programme once the initial hiccups are sorted out. These are not ordinary, run of the mill moves. There is a strong economic philosophy behind the same. Whether it is GST, demonetization of high value currency notes, massive financial inclusion programmes like Jan Dhan Yojana, connecting the country with a digital network or making people come into the mainstream of the economy by online transactions, in years to come, several of these programmes would become case studies by the students of history with an avid interest in the political economy. To be fair to the previous governments, irrespective of party affiliations, quite a few of their decisions were born out of either economic compulsions of the times or strong economic ideology of those behind the same. For instance, the economic liberation of the 1992, unveiled by P V Narasimha Rao Government, was born out of the hard economic conditions of that time when we had closed ourselves to the rest of the world, so much so, we were not able to earn enough foreign exchange to keep us going and we were perilously complacent with sub-standard products and technologies. While the 1992 liberalisation was born out of compulsions, it became a turning point only when the narrative of economic reforms received a widespread popular support. There was resistance by some narrow interest groups; but they had to give in once the ideology behind the reforms was acceptable to the nation with a conviction and it continues till date. Some critical decisions were a tad slow to implement, but have great consequences. The entire initiative of inter-linking of rivers, which was conceived by the Atal Bihari Vajpayee Government between 1999 and 2004, is still in the works and would certainly be a life-changing for millions of farmers and the rural landscape that has to face the fury of either floods or drought. It is again the Vajpayee Government which threw open the country’s telecom sector that has resulted in a revolution, benefiting each and every citizen. No other parallel is yet to emerge where the much talked about bottom of the pyramid has so much been positively affected as is done by the telecom. The decades of the 50s, 60s and 70s also saw several critical decisions which were result of the ground economic realities of the time and also reflected national priorities. After Independence, the focus was on building a strong industrial base, on the foundation of a robust and large public sector, along with institutions of great learning as IITs and scientific strides including space leaps, which are still doing great work. The decision to go in for devaluation of rupee came in the 60s came in for criticism from within the Congress Party and then Prime Minister Indira Gandhi felt, the fault lied with her advisers. But, the most important decision of her’s was the bank nationalization of 1969, which reflected a popular sentiment of the banks being the exclusive clubs of a few corporate houses. Having expanded and doing a great reach out from class and mass banking, there is again a clamour for privatization. In the mid-80s, it was Rajiv Gandhi who talked about taking India into 21st century. Dr Manmohan Singh may have been credited with opening the Indian economy, but the national mood was prepared by Rajiv Gandhi, helped by his friend-turned foe V P Singh. The national mood for more and more opening of the economy has again been well captured by the Modi Government which is dismantling further barriers; like the Foreign Investment Promotion Board has been done away with and it is far easier to bring in foreign investment. For domestic investors, the focus is on systemic reforms rather than discretionary powers of bureaucrats. Economic reality of the country is ever so changing, for better! *Prakash Chawla: Author is senior journalist and commentator. He mostly writes on political-economy and global economic issues.